We warned you back in March that we were getting close to 80 per cent of all applications being submitted online, well with the release of the quarterly planning application statistics by DCLG last week we can see that we have made it! Over the quarter Jan-Mar 2014, a whopping 81.6 per cent of all planning applications submitted across England and Wales have been made online via the Planning Portal. With the average over the financial year 2013/14 standing at just shy of 77 per cent, we’re on track to meet the long-term objective of an average of 80 per cent over 2014/15. Well done the whole Portal team who have worked so hard on this for so long and in particular our frontline staff on the support desk and account managers who work closely with our customers – whether applicants, agents or LPAs – on a daily basis. And of course many thanks to you, our customers for your support, passion and on occasion, your patience! 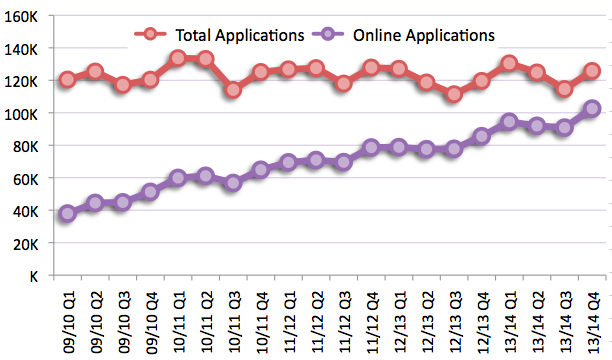 As you can see from the graph below, applications overall are continuing to rise at a rate of knots. ITS A GOOD SERVICE DONT BUGGER IT UP BY PRIVATISATION. THE SAME DUMB THING IS HAPPENING TO THE LAND REGISTRY. SLEEP WALKING TO DISASTER IN THE NAME OF WHAT PRECISELY? I am intrigued that with such a wonderful on-line system which is apparently so good and so easy, how is it that you need so many staff working so hard ? “So many staff”? I’m sure those ‘in the know’ will correct me if I’m wrong but I was under the impression the portal team is fairly small?